Often, Ladislav Sutnar is described as the ‘progenitor’ of information design. However, before him there was another great designer to whom this discipline should be grateful. He was the Russian artist, designer, photographer and typographer Lazar Markovich Lissitzky, more commonly referred as EL Lissitzky. During the early 1920s, he designed three books which could be now considered as the early stages of information design. In these books, he introduced the concept of visual programme and functional design, working with shapes and colours purposefully organised and creating a visual unity throughout the pages. In addition, he achieved visual clarity and understanding as a consequence of well-structured ways of organising both typographic and visual information. Below these three books are explained in more detailed. The Story of Two Squares (1922). 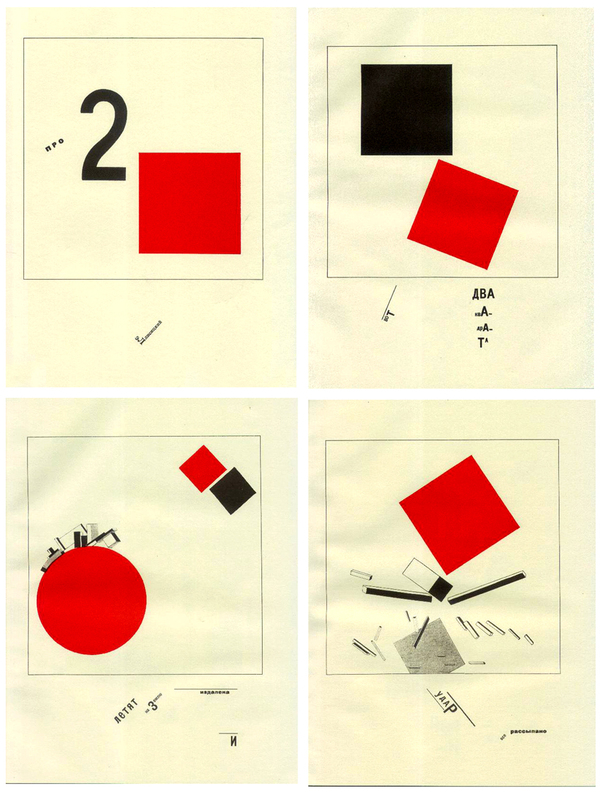 First, EL Lissitzky designed the book The Story of Two Squares, in which the main story was a symbolic narrative ‘starring’ by a red square and a black square. When this book was first published in Berlin in 1922, about 2 [Squares] presented a radical rethinking of what a book was, demonstrating a new way of organising typography on a page and relating it to visual images. Colour application was a key element in this book, introducing the idea of colour-coding information. For the Voice (1923). Later in 1923, El Lissitzky created a visual book using a collection of Vladimir Mayakovsky’s poems as the main source of information. In this book the 13 most often quoted poems in speeches from supporters of the Russian revolution (1917), were visually presented. The way the information was organised within each page, and how it was coded throughout the whole book could be considered a first step towards functional design. Each poem was synthetically visualised with an icon on the right-bottom side of the page, helping the viewer to know which poem was coming before and after. The Isms of Art (1925). 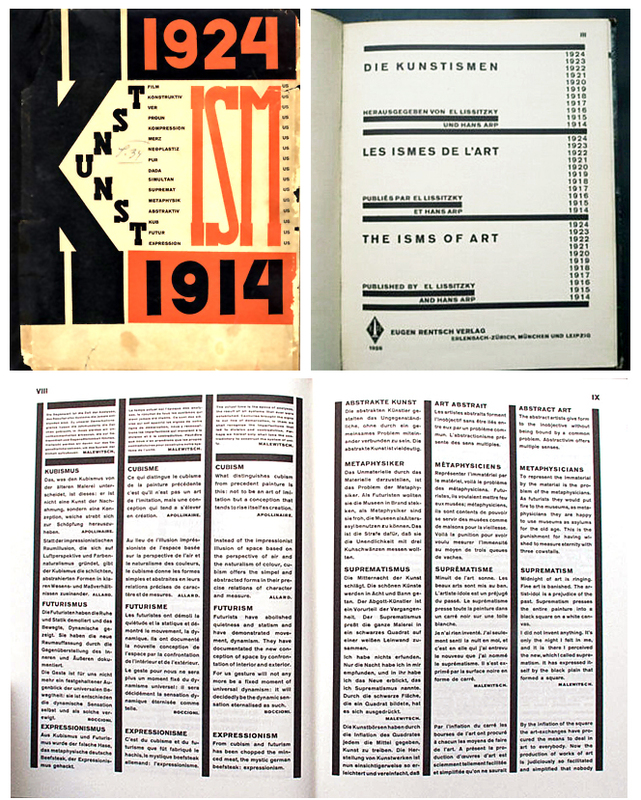 EL Lissitzky and Hans Arp designed the book The Isms of Art, composed of 8 pages with 76 illustrations, and information in three languages (German, French and English). In it, a high amount of typographic and visual information was organised into a cohesive whole based on structural relationships, creating a clear layout. This book was one of the first steps towards the concept of visual programme for organising information. The three-column horizontal grid structure used for the title page, the three-column vertical grid structure used for text, and the two-column structure of the contents page became an architectural framework for organising information. Asymmetrical balance, and skilful use of white space are other important design considerations of this work. In addition, he used large, bold san-serif numbers to link the pictures to captions listed earlier in the contents page, thus these numbers became compositional elements. More recently, Karl Gerstner (1964) introduced the concept of graphic programme to the graphic design discipline, presenting a design method called the ‘morphological box of the typogram’. Gerstner created a systematic method, merging art and science, that is capable of generating a broad range of design solutions in which results are not fixed and the form should and must take its shape in obedience to an order or formula. The method (graphic programme) sets the rules about combining the elements in order to create a design formula. The more exact and complete the formula is, the more creative the work becomes. Beyond the design discipline, the importance of Gerstner’s programme is its conceptual applicability to other disciplines. Josef Müller Brockmann’s work constitutes another key contribution to functional design, but it deserves a post for its own. – Gerstner, K., 1964. Designing programmes. In: H. Armstrong, ed. 2009. Graphic Design Theory, reading from the field. New York: Princeton Architectural Press, pp.58-61. – Gerstner, K., 1968. Designing programmes, four essays and an introduction. 1st ed. London: Tiranti. – Meggs, P.B., 2006. Meggs’ history of graphic design. Chichester: John Wiley.